We are very pleased to announce complimentary online access to the New York Times is now available with your library card! Free Library card holders will now have free access to NYTimes.com and all NYT mobile apps, as well as the paper's international editions. With the New York Times, you will find a variety of topics covered with unsurpassed quality and depth through breaking-news articles, blogs, videos, and interactive features. It's one of the country's most distinguished papers of record. With your library card you will have access to the current and historical New York Times (*see below for details and restrictions), international editions, Spanish and Chinese language editions, and special features. From any desktop computer in one of our libraries or on your own device usnig the Free Library's Wi-Fi network, your access is automatic once you create an account and log in at NYtimes.com. You will find a link to the New York Times at the Library on our database page. From home, work, or on the go, follow the New York Times Anywhere link found on our database page to claim your free 72-hour pass for New York Times digital access. Create an account at NYTimes.com and log in to start reading. At the end of your complimentary 72 hours, you can return to our database page, click the link again, and claim an additional pass. There is no weekly or monthly limit to the number of passes you can claim. 3. Already have a NYTimes.com account? Simply log in with your email and password. 5. A confirmation page will appear advising when your 72-hour access expires. 1. Return to the link New York Times Anywhere on our database page. 2. Log in to NYTimes.com with your email and password. 3. Redeem another 72-hour pass. *Details and Restrictions: The crossword puzzle is not included in access with your library card. NYTimes Cooking is not included. When you access NYTimes.com from the library or from home, you will have access to content from 1981 to present day as well as 1851 through 1922. Access to content from the years 1923-1980 is not available when accessing NYTimes.com from within our libraries or on our Wi-Fi network. When you visit NYTimes.com with a 72-hour pass from your home, office, or mobile device, you will have access to five articles from 1923 - 1980 with each 72-hour pass. 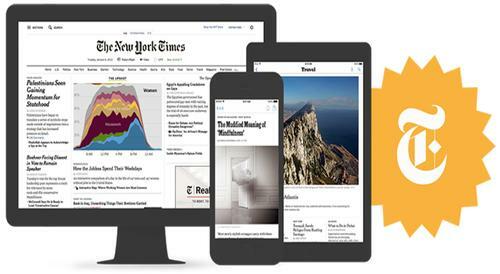 Free access to The New York Times is now available! Have you asked if the Philadelphia Inquirer wouldn't be interested??? Thank you! This is awesome! I love our library. We are so grateful and fortunate. I already have a New York Times account, but I do not have a paid subscription. I tried to get a 72 hour pass, but do not see any "Redeem" code. Need some help. Hello Rita - if you go to the Database page on our website (link in the article above) and click the link for NYTimes Anywhere, you will be prompted to enter your library card number and PIN. After that, you will get to a page with the redeem code. If this is not working for you, please email us using the Contact Us at the bottom of this page. One of our librarians will be able to work with you to figure out the issue. Thank you. I have been trying to share this information on social media and none of the links work! Hi Joanne - that's great! Please spread the news. However, the NYT must identify web traffic as originating at the Free Library website in order to work correctly, so a direct link won't work. If you want to share a link, just send your friends to our database page (http://libwww.freelibrary.org/databases/index.cfm) and ask them to click the link to the NYTimes Anywhere. Or just share the link to this blog post. Thanks! This access to the New York Times historical news archives is just another example of the continued value the Free Library of Phila. has given to its many useful services. Of which, I have "exploited" time and time again. Accessible by all with only a free library card that, I'm sure, will go unnoticed by the vast majority of the populace within the city. Thank you for another gift. Add a Comment to Extra! Extra! New York Times Online Now Free With Your Library Card!